MIDAS can be configured to send email via an external SMTP server/relay. This article outlines how to configure MIDAS to send email via Microsoft's Outlook/Live/Hotmail SMTP servers (a valid Microsoft account is required). The email settings within MIDAS may be accessed via MIDAS Admin Options → Manage MIDAS → Email. Replace "your_email@outlook.com" with your actual Outlook/Live/Hotmail email address, and specify the corresponding password. Also, ensure that the "STARTTLS?" option is selected. Click "SMTP Test" to test the settings you've entered. If all goes well, you'll see a confirmation that a test email was successfully sent. 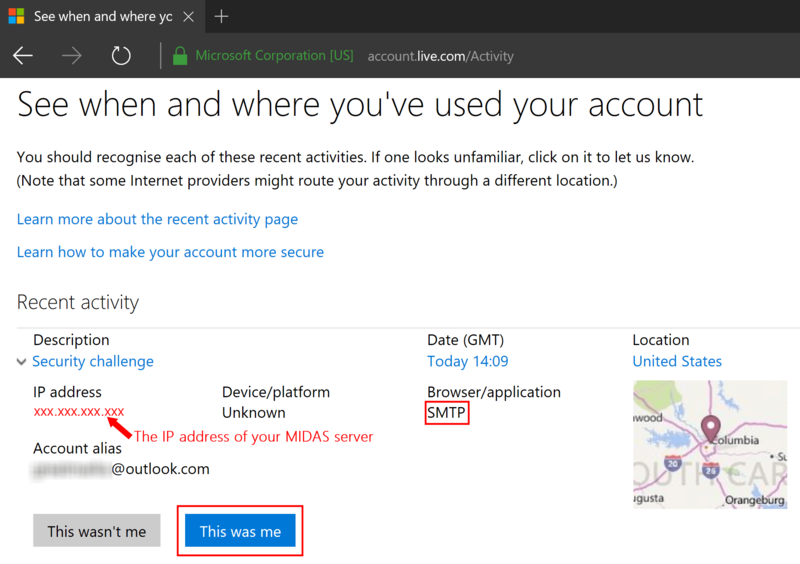 If, however, you see an error message along the lines of "Error: 535 5.0.0 Authentication Failed" ...then assuming the credentials you entered were correct, then this error is most likely a result of Microsoft blocking external access to your Outlook/Live/Hotmail account from an unknown location/app (i.e. the server where your MIDAS system resides). To resolve, simply point your browser to https://account.live.com/Activity. This will grant future access to your MIDAS server to be able to send email via your Microsoft account. TIP: If you don't see "This wasn't me" / "This was me" buttons and you're using a non-Microsoft browser, try again using Internet Explorer or Edge. Back in MIDAS, click the "SMTP Test" button once again. If all goes well, you should then see a confirmation that a test email was successfully sent.